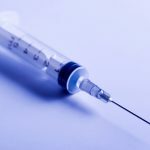 The U.S. Food and Drug Administration’s (FDA) has released information regarding entry line refusals for first month of 2017. 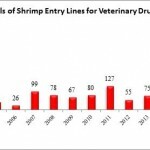 In total, 8 of the 145 (5.5%) entry line refusals in January were of shrimp for reasons related to banned antibiotics. Jiachang Aquatic Product Co. Ltd. (China), a company that has not been exempted from Import Alert 16-131, had one entry line refused for “seafood salad (shrimp, crab, etc. ), mixed fishery/seafood products” contaminated with veterinary drug residues in the Los Angeles District. The number of entry lines reported as refused in January for Thai-origin shrimp is extremely unusual. Prior to last month, since 2002 the public information available indicates that there have been a total of just 17 entry lines of shrimp refused from Thailand for reasons related to banned antibiotics. Fifteen of those seventeen refusals took place in 2003. In other words, in the thirteen years between 2004 and 2016, just two entry lines of shrimp from Thailand were refused by the FDA for reasons related to banned antibiotics. All five entry line refusals were of shrimp products shipped from Narong Seafood Co., Ltd. As the Southern Shrimp Alliance has previously noted, Narong Seafood Company (BAP: P10456) has been certified under the Global Aquaculture Alliance’s (GAA) Best Aquaculture Practices (BAP) program as a one-star shrimp processing plant. Currently, the GAA’s website indicates that Narong Seafood Company’s BAP certification is valid until April 20, 2017. The entry line refusals for shrimp products shipped by Narong Seafood Co., Ltd. for reasons related to banned antibiotics are another unusual development for any Thai company.